“Healthy” foods are all the rage, and we sometimes wonder what all the fuss is about. Foods are healthy if they are consumed in reasonable portions, taking account that some foods have higher caloric content by weight (so-called caloric density). The not-so-revolutionary notion is that we should eat smaller portions of the higher-caloric foods. Nevertheless, attention to calorie consumption remains important, and we saw Wolfgang Puck, one of our favorite chefs, has a book coming out in March 2014 titled, Wolfgang Puck Makes It Healthy. As a kick-off for the book, he shared a recipe in one of our local newspaper that we wanted to try. The recipe is a satisfying vegetarian main dish. We include the ingredients and directions here. To prepare ice water: Fill large bowl three-quarters full with ice cubes and water. Set on counter near stove. To blanch vegetables: Bring medium saucepan of water to a boil. Add 1 tsp salt. Add broccoli. Cook for 30 to 60 seconds or just until broccoli’s color brightens. Immediately transfer to ice water. Add peas to boiling water. Cook for 1 minute. Drain in colander. Transfer peas to ice water with broccoli. Let vegetables chill for 1 to 2 minutes. Drain well. Transfer to paper towels to soak up excess moisture. Pat dry. Set aside. To prepare pasta water: Bring pasta pot filled with water to a boil. To sauté vegetables: Meanwhile, heat 12-inch frying pan or Dutch oven over medium-high heat until hot. Add olive oil. Heat until oil swirls freely in pan. Quickly add bell pepper and mushrooms. Add blanched broccoli and peas. Toss or stir briskly for 1 or 2 minutes or until heated through thoroughly but not browned. Stir in tomatoes. Bring to a simmer. Cook for 1 to 2 minutes or until juices thicken slightly and vegetables are tender-crisp. Season top taste with salt and pepper. Remove pan from heat. Cover. Keep warm. To cook pasta: Meanwhile, as soon as pasta water comes to a full boil, add 1 Tbsp salt. Add pasta. Cook, following manufacturer’s suggested cooking time, until al dente–tender but still slightly chewy. Drain pasta. To serve: immediately add pasta to vegetable mixture in pan. Toss well. Taste and adjust seasonings as necessary. Garnish with parsley. Serve immediately. Pass parmesan at table. 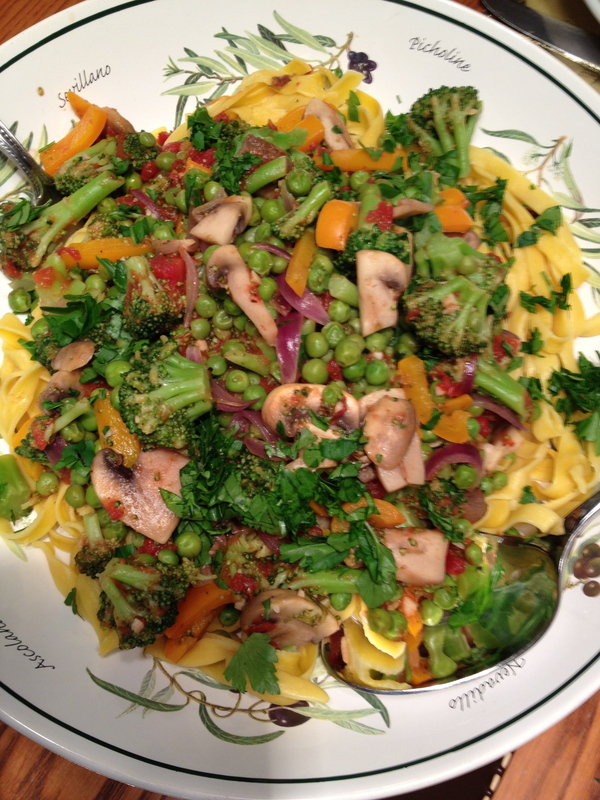 This entry was posted in Cheese, Vegetable and tagged baby peas, bell pepper, broccoli, button mushrooms, fettucine, main dish, olive oil, Parmesan cheese, parsley, tomatoes. Bookmark the permalink.